I thought some of his ideas were a bit outrageous and yes, sometimes crazy. Over the years, I have learned to tame that judgmental part of me before I know the facts. I have learned to take a new approach to learning to swing like the best that has ever struck a golf ball. Here are a few thoughts that might help you with getting your mind straight before I get into some “radical” concepts. First, take nothing Moe says for granted. Most of Moe’s ideas of the golf swing were his way of explaining the unexplainable. Moe was doing his best to describe his feelings. Second, try not to judge it until you understand it. When I talked to Moe about his golf swing, he often said “Swing the handle, not the head”. I found this insight to be a jewel and when I understood Moe’s golf swing. This meant that you have a relationship to the golf club not the golf ball. If you maintain this relationship, the ball simply gets in the way of the movement of the club. With this understanding, I began to understand his address position and discovered that some of the things I thought of as “idiosyncratic” were quite possibly “secrets” to great ball-striking and consistency. Consistency is a characteristic of great ball-strikers and Moe was the personification of it. Let me introduce you to a few concepts, which many find idiosyncratic, that I want you to experiment with and see if they can help you Swing Like Moe. 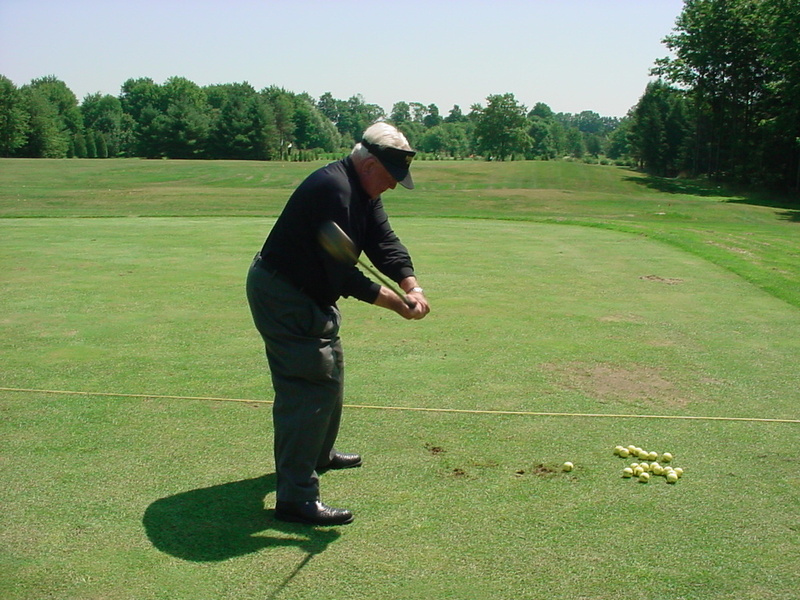 Moe Norman’s club shaft position at address mirrored the club shaft position at impact. We call this the “single plane” . If there is a secret to Moe’s golf swing, this is it. Yet, as much of a secret as it may seem, it actually is perfectly logical. Moe established the “single plane” based on perfect club design. In other words, the club at address and impact are exactly the way the club is designed. The secret, if there is one, is how Moe swung the golf club -the club mechanics- in the most efficient way possible to return the club back to impact. It is how Moe established this ideal “single plane” that demonstrates his genius. Club Behind the Ball – a key to simplicity and alignment? When it came to Moe’s golf swing, Moe did something very unique at address. He placed the golf club well behind the ball. This club head position established a relationship to the handle of the golf club. You can see at address that Moe placed his club head well behind the golf ball relative to the target line. W hen you look at Moe’s address position with every club, you will see a similar relationship and shaft angle. I found this to be an important geometry. Moe has established a relationship to the h andle of the golf club. This angle shows how his hands are ahead of the club head (relative to the target). Although, swing plane is established at address and returned at impact, address is not impact. There is a lateral element to the golf swing where the hands, while centered at address, are more forward at impact. Moe found a solution for this dynamic in the golf swing by placing the club behind the ball and by doing so, maintained the relationship of the handle of the golf club to the body. During one practice session with Moe, I was standing adjacent to him on the driving range where he was hitting balls in the station behind me. I turned to watch him hit and as he addressed the ball, with my club, I pushed his club head directly against the ball and said “hit it from there”. Moe paused and looked up a bit bewildered. With a moment of thought, he said “I can’t”. “It’s not me”, he responded. Moe thought for a moment and said “I take it outside”. Moe demonstrated by taking the club in an outward movement away from the ball. “This is what happens”, Moe said. When Moe placed the club behind the ball, he was ensuring perfect club movement away from the ball. With much of golf instruction talking about how it is important to take the club back low to the ground and with slow rhythm; “How can it be any lower and slower than that?” was Moe’s comment. “There are four things I can’t do (placing the club one foot away from and behind the ball) , I can’t take it outside, I can’t pick the club up, my right shoulder is already into my turn and I eliminate one foot of my backswing”. A common noticeable characteristic of Moe’s golf swing was his impact position where both feet were firmly flat on the ground. Often interpreted as weight being on his trail (right) foot at impact, the opposite we actually true. While both feet are flat on the ground, most of the weight during this position is on his left foot. Defying convention, the feet on the ground at impact is the most stable and perfect body position at impact yet it is only achievable from a single plane position due to the mechanical movement of the golf club on a single plane. This position also demonstrates that the spine can maintain its angle and position from address through impact – reducing stress and compression. When I asked Moe to describe the placement of his ball in his stance, he told me that he never moves the ball. It remains in the same position with every club, inside his lead heel. This is an interesting phenomenon. It is a matter of perception. If you keep the ball at the lead heel position, and move your trail foot, you will notice a significantly different position of the ball relative to the body. In other words, the ball didn’t move. Moe did. So, as the club was longer, Moe’s stance would widen. Without moving the ball position relative to his lead foot, the ball would move forward for the longer clubs as his stance widened. As you move the club away the club stays low to the ground however when it reaches a point just past the coin, The hands hinge and the trail arm folds. Because of the relationship established at address with the “pivot point” and the hands ahead of the club head, the hands are always leading the club. Even when you are in your back-swing, the handle / club head relationship remains. Anywhere in the golf swing you will find this relationship. What this means is that since the hands are leading the club, the club will “follow” the handle. Further in the backswing, the hands hinge and the trail arm folds. “Up and never around” Moe Said. This hinging and folding moves the club on plane. It is impossible to be on plane if the hands are not correctly leading the golf club. These relationships, established at address and throughout the swing are the “geometrical equivalent” of the framework to a car. They establish a foundation for the club movement. When you begin there, you can maintain it throughout the motion. By establishing and maintaining this framework, Moe would comment that the club went “up and never around, like a pendulum”. Moe felt as though the club never went behind him. In fact, he felt as though there was a wall behind him and the club would never hit it. This hinging of the hands, when done correctly, creates an on plane club shaft and club face.